With the spike in gasoline prices over the last five years, plug-in electric vehicles (PEV) are becoming increasingly popular, and auto industry analysts predict that Florida will be among the leading states in the country for PEVs. For those who reside in a single-family home, plugging in these vehicles for overnight charging presents little difficulty, however the challenges of charging them overnight can be significant for someone who lives in a condominium. Our firm has already had several condominium association clients inquire about their responsibilities and options for accommodating these cars, and their approaches toward finding a solution can vary a great deal. There are three different levels of PEV charging stations. A level one charging station requires a standard 110-volt household outlet and takes anywhere from 12 to 20 hours for a full charge. A level two charging station uses a 220-volt outlet – such as those that are used for large kitchen appliances, water heaters and washer/dryers – and is two to four times faster than a level 1. 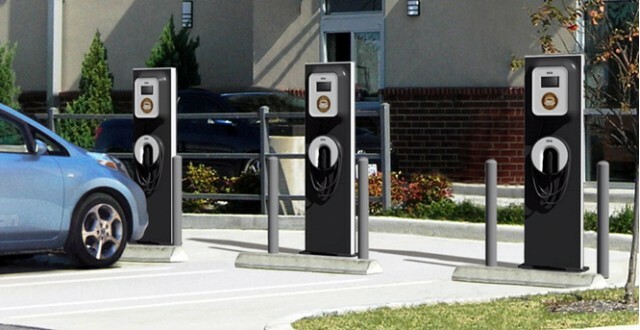 A level 3 charging station is the most expensive type of charging station costing in the range of $50,000 and therefore not likely to be considered by most associations. Due to the abundance of standard 110-volt outlets coupled with the low cost of installation, a level one charging station would seem to be the easiest to deploy and use, and many condominiums may be able to accommodate PEVs simply by using existing outlets or installing new ones in the parking garage. As PEVs become more and more popular however, associations may want to consider installing a level 2 charging station in order to make the property more appealing to their current and future unit owners with electric cars. The installation cost for level 2 charging stations averages around $2,000 for basic models and, in addition to the faster charge times of four to eight hours for a full charge, some of the more advanced level 2 charging stations also feature retractable or suspended cords, usage tracking and billing capabilities, and the ability to charge up to four cars at once. There are several challenges for condominium associations when dealing with these charging stations. First, as we know, parking spaces are hot commodities in condominiums. Therefore, determining the most beneficial location for installing a level 2 charging station could present an issue for a condominium, as could a request for the installation of additional level 1 outlets throughout a parking garage. Generally, there is nothing in a condominium’s governing documents that would obligate an association to equip a parking space with a separate electrical outlet. However, because most board’s are empowered to approve an owner’s request to install one (since residential unit owners cannot usually make any additions, alterations or improvements in or to the common elements without the prior consent of the board), the next issue is overcoming the location. Are there any common element areas where a station could be installed? Will the association have to ask owners to transfer, swap or relocate parking spaces? Does the association have the power to require owners to swap or transfer their parking spaces? These are all questions that must be answered before a condominium can make a determination as to what type of charger to install and where to put it. Additionally, associations should be advised that utility costs incurred by an individual owner through the use of the electrical outlet would not constitute a common expense for which the association and, therefore, all the unit owners would be responsible. Therefore, associations should require that the utility costs for the electrical outlet be separately metered and billed directly to the unit owner. FPL can add sub-meters for these outlets in order for the association to bill the PEV owners for the electricity that their vehicles consume. FPL estimates that electric bills will go up by approximately $34 per month in order to charge a PEV enough to drive 1,000 miles per month. The company offers some excellent information and resources for condominium associations that are considering their options for accommodating PEVs at www.fpl.com/electricvehicles, and questions can also be sent to electric-vehicles@fpl.com. Again, while the location of such a station in the parking garage and the allocation of parking spaces around it for PEVs present certain obstacles for associations, the added benefit and marketability of the property to PEV owners could easily outweigh these financial and administrative burdens. And, as the usage of PEVs continues to grow, progressive-minded associations that embrace this new technology could gain a significant marketing edge by helping their unit owners to go green and drive electric.